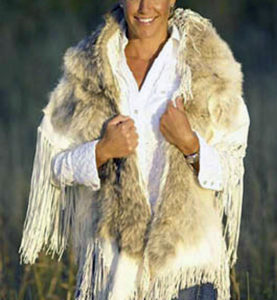 JK BRAND Mini shawl in white deerskin with Cinnamon fox trim and hand-cut fringe. All fringe on any JK BRAND item is hand-cut with scissors. This makes your JK BRAND shawl, belt, pillow etc. truly unique, one-of-a-kind.